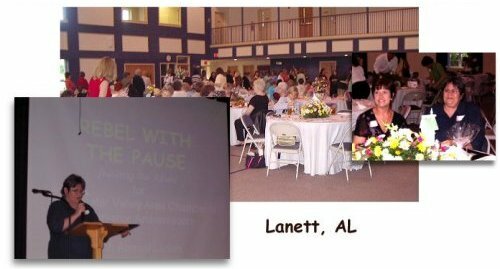 Speaker available for Menopause or MidLife conferences! Announcing....the Rebel with the Pause! 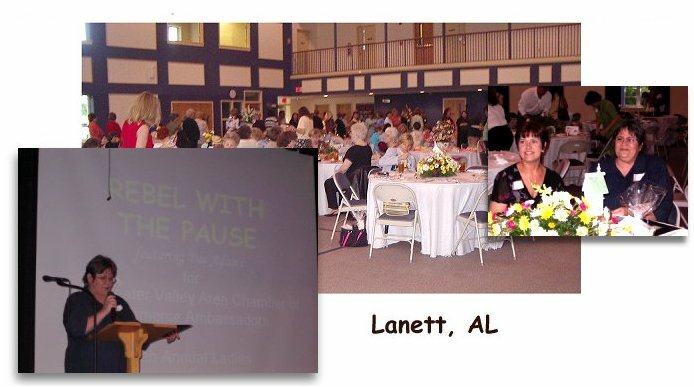 If your group or organization is having an event or conference, get your message across with a humorous presentation by me, Dee Adams, cartoonist, author, entreprenuer, creator of "Minnie Pauz". Using my cartoons as a visual expression of the plight of the middle-aged woman (and those who love them, work with them or just SEE them), I can bring a light-hearted view of a serious and intense time that every woman will have to experience. For 10 years my website and cartoons have been entertaining and informing thousands of women, men, & medical professionals from around the world. 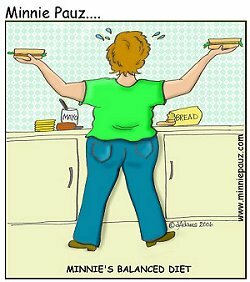 Find out why TIME and PBS featured Minnie Pauz and why these cartoons are valued by women and medical professionals everywhere! Presentations designed for your specific audience, including custom cartoons. This is the most requested talk about how I became a cartoonist at almost 50, how I overcame depression and financial distress just as I entered midlife and how the humor has helped me survive menopause and other middle rage situations. "My story" seems to be just what other women want to hear about! "There's More to Me Than Just ........"
If I could remember what I was going to say, I'd finish that title! When one woman "of a certain age" is talking to another in the same age group, we dont even have to explain why we don't finish our sentences! It's almost like having a secret language. When it happens, everyone just nods their head in agreement and they carry on! Then when the rest of the sentence suddenly appears, that too is understood. This would be a great spy technique for the CIA....have 6 middle-aged women discussing top-secret information and NO ONE would be able to figure it out! Oh yeah, there's more to me than just hotflashes! This presentation includes some of the stories I've heard from women about how humor has helped them get through the tough times. A frank, but hilarious discussion of the "35 Symptoms" using MP cartoons to illustrate how we can all benefit from this particular type of HRT. 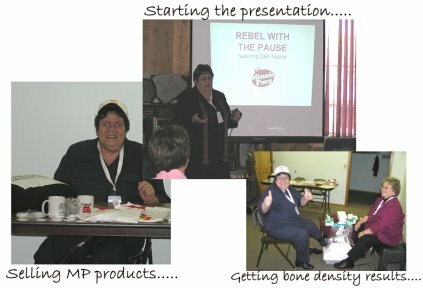 "Menopause is NOT for Sissies"
You really have to be tough to go through menopause! And I have the T-shirt to prove it! It's not easy to deal with all these changes when everyone around you thinks you're nuts. It's hard to maintain your composure when your face turns beet red during a corporate meeting and your colleagues call 911. "Hot As Hell and Not Going to Take it Anymore!" Women are taking charge of their health like never before. It's no longer enough to rely solely on that wonderful, caring family Doctor. Why? Because this generation of babyboomers wants to figure out what is going on, find all the available options, make informed decisions, resolve the problems and get on with their lives! "Inject Humor Into Your Practice"
Are you having trouble keeping your sense of humor when dealing with middle-aged and menopausal patients? Are you stuck in the traditional thought and management theories? 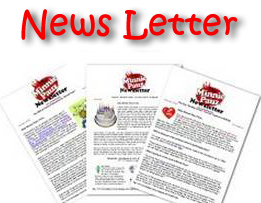 Are you uncertain about what is funny or not funny to women suffering with hotflashes and more? for any purpose without the express written permission of Dee Adams.